To better enjoy the benefits of light. Venetian blind : The world’s best selling, for obscuring or dimming, it’s very effective and easy to maintain. 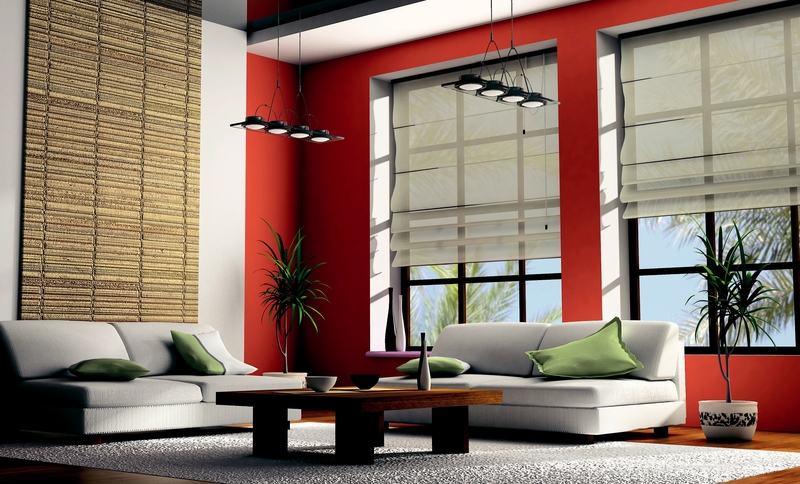 Solid and practical, the Venetian blind is available in a wide choice of colours, aluminium or wood. California blind : Vertical blind, adjustable to 180 °, it can chase the sun all through the day. Ideal for big surfaces (bay windows, verandahs), the California blind is available in a wide range of fabric based on the desired level of sun protection (dimming, obscuring, broadcasting, filtering). Roller blind : Its vertical distribution adapts to the path of the sun and modulates the quantity of light like a sun umbrella. Compact and aesthetic, the roller blind fits all types of openings and it is ideal for shadowing. Pleated blind : Compact and simple, it is fitted to all types of openings. Folding in the manner of a concertina, the pleated blind is the smallest model when folded. Also available in version with blind under the roof and is the best compromise between efficiency and quality/price ratio for bay windows and zenith windows. External venetian blind : Just like a Venetian blind, it blocks the sunlight before reaching glass pane. So that it minimizes the heat introduced in the rooms. A80 box blind : Rollable and motorizable, it is designed to protect medium and large bay windows. Robust, suitable for indoor or outdoor. Vellum blind : Ideal for the protection of a verandah or in replacement of shrubs (up to 24 m² living space), it provides an effective and aesthetic protection. Rollomagic blind : It combines the darkening effect of a venetian blind and the decorative effect of a bi-parting curtain. American blind : The best decorative curtain par excellence, it allows the choice of valances and fabrics based on the desired protection. Bi-parting Curtain : Best for very large openings, it’s equipped with a manual or motorized drive system mounted on a compact and robust rail. Japanese wall blind : Decorative and designed to split or cover bay windows, it is very effective and works well based on the fabric used and the desired effect. The system of layers can include up to 5 sliding panels. Awning blind : Installed on the facade or on the stands, it can be operated by hand or by motor. The rolling awning blind is available in a wide selection of fabric and will provide a refreshing shade during the hottest hours and protection against humidity in the evening. Bio-Climatic pergola : Consisting of rotating and retractable Aluminium blade, fixed in a structure of the same material. If you close the sides with glass frames, the bio-climatic pergola becomes a winter verandah. Closing for balcony and open terrace : Glass enclosures without studs with folding doors on sliding rails. Not thermally insulating but these systems protect terraces and balconies from wind or rain.